5 How to Buy Oriental Insurance Policy Online ? Oriental Insurance Company Limited has recently introduced various Online Services such as Online Payment, Online Buying, Online Renewal Services for the convenience of the customers. The Oriental Insurance Online Payment is one of the best online services offered by the company for their clients. Through OICL Online payment, one can buy any of the Oriental Insurance policy through online. With these new services, there is no need to visit the OICL branch office every time to pay premiums or renew the chosen policy. The oriental general insurance company Ltd has developed various types of insurance covers to cater to the requirements of both the urban and rural population of India. It provides excellent customer service and runs the business through an efficient claim management. The policyholders of Oriental Insurance company can pay their premium amount through online. For that purpose, the insured should visit the official website. By logging into the official site, one can see the online Renewal option. By selecting that option, you can calculate your Premiums and Pay Premium Amount through online using Net Banking/ Debit Card/ Credit Card. Thus Oriental Online Buying or Oriental Insurance Online Renewal is a very easy process. Here, we have provided the complete steps to pay the Oriental Insurance Premium Online. Customers can make use of this OICL Online Payment Service to pay premium online for any of the Insurance products offered by the Oriental Insurance Company. So, go through the following sections of this article to know more about the Oriental Insurance Company Online Payment. By using the premium online services of OICL, the insured can pay the premium anywhere in the world and at any time since it offers the 24/7 services. For this purpose, the policyholder must have the login. Hence to access the online services, the insured must create the login for his policy. For the sake of those policyholders, we are providing the login procedure for the registered candidates and new users and also how to make a premium payment, online renewal, online buying processes. Using the OICL Login portal, the customers of Oriental Insurance Company Ltd can pay their premium amount for renewing their policy. The Oriental Insurance Online Payment process for the registered users is as under. Click on Sign In option appearing at the top right side of the home page as shown below. By clicking that, a drop down appears on the screen with two options namely User Id and Mobile that means you can login with either of these options. 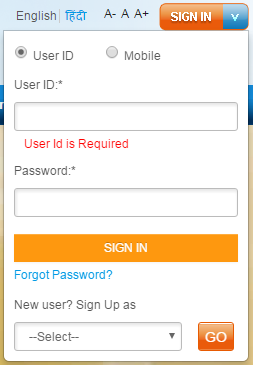 Enter your User ID & Password in the OICL login page. Now on your personal account page, you can see the various Online Services offered by the Oriental Insurance Company. In that, select “Pay Premium Online” option. Now you will direct to Online Payment Gateway Page. Pay the Premium amount using Net Banking / Credit Card / Debit Card. With this step, Oriental Insurance Online Payment process has completed. With the Oriental Insurance Online Payment facility, one can renew their policy easily within minutes. 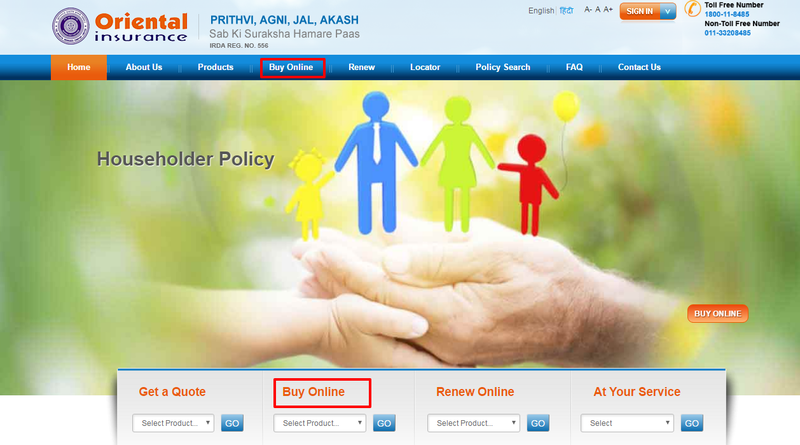 The Insured should follow the below steps for the oriental insurance online policy renewal. Click on Renew Option present on the home page as shown below. Now you will redirect to OICL Policy renewal page. In that, Enter your existing policy number. After that enter the policy details, your personal details, and Calculate the Premium. Finally, Click on Renew now button. The policyholder will now redirect to Online Payment Gateway Page. Pay your Premium amount online using Credit Card/ Net Banking/ Debit Card. Now the insured will get a Confirmation Message on post payment. On successful completion of payment, the policy will be Renewed. How to Buy Oriental Insurance Policy Online ? Any individual who wants to take the Oriental Insurance Policy can purchase the best policy in online using Oriental Insurance Online Payment Service. Here you can also compare various policies offered by the company. But to buy any of policy from Oriental Insurance company in Online, the policyholder should follow the below steps. Click on Buy Online option available on Home Page. Now a drop down appears on the screen showing various products of OICL. Select one policy which you want to take from the list of products like Motor Insurance, Personal Accident Insurance, Mediclaim Policy, etc. Now the insured will redirect to Buy Online page. Enter all the primary Insured details required to Buy the Policy. Also, Enter Additional Cover Details if available. Finally, click on Calculate Premium button to check Premium to be paid to get the Policy. Now your premium amount will be generated on the screen. Once Again Check the Premium Amount and click on Proceed. After that, you need to enter your Personal Details. Now you need to Click on Save & Next. Then you will go to the final step of your online buying process i.e., Payment step. In the Online Payment Gateway Page, pay the premium amount using Net Banking / Credit Card / Debit Card. Now you will get the Confirmation Message of Online Payment. On successful completion of payment, your chosen policy will be issued. Filed Under: General Insurance, Oriental Insurance Tagged With: oriental insurance online payment login, orientalinsurance.org.in.